2010 Mavizen TTX02. Picture credits - Mavizen. Submit more pictures. TTX02 is the world�s first production electric superbike. With a number of world firsts combined with the proven chassis from KTM and drivetrain from the TTXGP winning Agni bike; the TTX02 is an exclusive opportunity to procure a platform for development and racing across the entire TTXGP racing programme. Comments: Swappable drivetrain and batteries at trackside. Integrated IP connectivity. Linux based. USB based system bus allows a virtually unlimited number of peripherals to extend the capabilities of the machine with plug�n�play. Remote factory support package available. Ask questions Join the 10 Mavizen TTX02 discussion group or the general Mavizen discussion group. Get a list of related motorbikes before you buy this Mavizen. Inspect technical data. Look at photos. Read the riders' comments at the bike's discussion group. And check out the moped's reliability, repair costs, etc. 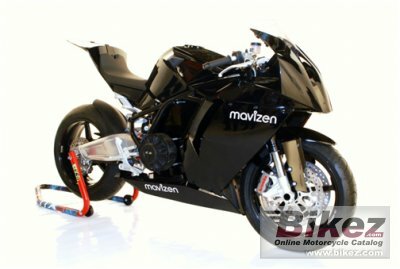 Show any 2010 Mavizen TTX02 for sale on our Bikez.biz Motorcycle Classifieds. You can also sign up for e-mail notification when such mopeds are advertised in the future. And advertise your old MC for sale. Our efficient ads are free. You are also welcome to read and submit motorcycle reviews.